A multimeter is the basic tool for every electronics engineer and electrician. It is also useful for other professionals. 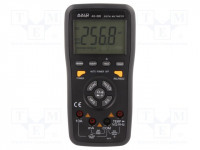 Modern multimeters are increasingly digital – their operation is based on advanced microprocessors. 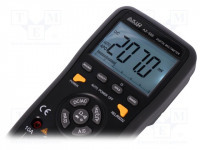 The Axiomet AX-595 – versatile, portable digital multimeter, is one of those devices. What sets it apart from similar multimeters is its lack of a mechanical dial for selecting operating modes and its ability to transfer live measurement results to a PC. When you first pick up the AX-595, you immediately notice that its design is rather unusual. Unlike most competitive products, there is no large, central knob surrounded with numerous small markings to be found on its front panel. Instead, you will find 5 grey buttons – those have the same functions as the knobs found on more conventional multimeters. This solution makes it easier to switch between the most useful operating modes since you don't have to precisely adjust a dial. All you need to do is press one of the big buttons. Thanks to its advanced digital system, the Axiomet AX-595 offers a large array of functions. Just like any other multimeter, it lets you measure current and voltage – both direct and alternating. It also lets you measure resistance, capacitance, frequency, temperature, as well as test LEDs and detect short-circuits. What's important, this multimeter also has additional functions that facilitate its operation. It automatically displays units of measured values, protecting you from making mistakes. Furthermore, you can freeze the current readout or use the meter in a seek for min/max value mode. Unlike older models, there is no need to manually switch operating range. This process is automatic, but you still have the option to manually force a range. Lastly, the multimeter shuts itself off after 15 minutes of inactivity. The built-in buzzer will warn you 1 minute in advance that the meter is about to shut itself off automatically. We should also mention that this automatic shutdown function can be deactivated by pressing and holding the "REL" button for more than 2 seconds. An "RS232" symbol will appear on the device's screen and the "APO" symbol will disappear. In this mode the meter is controlled via PC. – 0.1mV to 1000V for DC voltage measurements; – 1mV to 750V for AC voltage measurements; – 10µA to 10A for current measurements (direct and alternating); – 0.1Ω to 60MΩ for resistance measurements; – 10pF to 200µF for capacitance measurements; – 0.001Hz to 20MHz for frequency measurements. The temperature measurement range is -20°C to +1000°C. Using the multimeter is very simple. 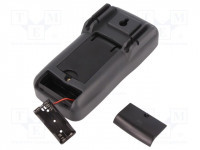 In its upper part, there is a dual 4-digit LCD display, with reading capacity up to 5999. The digits are 33mm high, providing excellent readability even at a long distance. Under the digits you can find the bar graph – a 61-segment graph that shows the measured value within the selected measurement range. Its length is refreshed 30 times per second. Under the display, there are four buttons. These are used for: switching the meter to seek for min/max value mode; testing the duty cycle of the alternating signal; holding the current measurement; and forcing a measurement range. Moreover, the yellow button located on the left is the power button, and the right button is used to switch the meter to relative measurement mode or PC mode. As usual, the bottom part of the meter has test lead sockets, and the top panel has a mini-USB port for connecting the meter to a PC. To measure frequency, press the "Hz/°C/F" button. Connect the test leads to the „VΩHz” and „COM” sockets. Connect the other ends of the test leads to the source of the measured signal. The current measure value will immediately show up on the screen. Note that in this mode, the bar graph is not displayed. This mode is used for frequency measurement by default, but you can also switch to testing the duty cycle of the signal. To do that, press the "Hz/DUTY" button. Press it again to switch back to test frequency mode. To transfer measurement results directly to a PC you must use the USB cable (included with the device). Connect it to the USB port located at the top of the device and to a PC. Then, press and hold the "RS232/REL" button to send data to that PC. To be able to capture and analyse data from the meter via PC you need to install the software that's included with the device. This portable digital multimeter not only offers a wide range of features, but also complies with high safety standards: EN61010 for 1000V in CAT III installations and 600V in CAT IV installations. This makes it suitable for professional electricians. It is very handy – its dimensions are 91 mm x 49 mm x 185 mm, and it weighs 410g. The whole kit includes: multimeter, test leads, K-type temperature probe, USB cable, software, and a soft case. The multimeter is powered by two LR03 (AAA) batteries. When you need to replace them, an icon appears on the meter's display.